How about “Hamilton,” the menu? 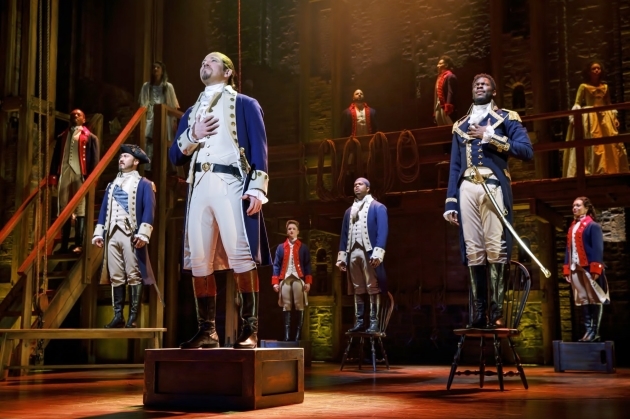 As Lin-Manuel Miranda’s blockbuster musical about the Founding Fathers and Mothers draws huge throngs to downtown Minneapolis — 120,000 people are expected to see the show during its six-week run at the Orpheum Theatre — restaurants in the entertainment district are getting into the spirit. Or, make that spirits. Some have created specialty cocktails inspired by personalities and themes in the show. One restaurant, Mercy, has created a three-course meal. The Founder’s Fizz at FireLake (31 S. 7th St.) includes gin, lime juice, simple syrup and soda water. Or you can order the Dueling Sangrias — “Hamilton red and Aaron Burr white,” according to server Karissa Tricas. At Brazilian eatery Fogo de Chão (645 Hennepin Ave), they’ve created a drink that takes off on the title of one of the most famous songs in “Hamilton.” The Rum Where It Happens is made of Cachaça, a Brazilian spirit made from fermented sugar cane. “It’s somewhere between a margarita and mojito,” said general manager Eliseu Ziger. He added that “Hamilton” patrons get a complimentary dessert with the purchase of an entrée. Over at Rock Bottom Brewery (825 Hennepin Av. ), they have brewed a beer called Burr-Berry Wheat. It’s infused with a blackberry essence but it’s not sweet. “It’s like a Honey Weiss,” said bartender A.J. Christiansen. Rock Bottom brewed 20 barrels, each containing 15 gallons. Patrons have been guzzling Burr-Berry wheat. There are only eight barrels left. That beer popularity is good news not only for Rock Bottom, but also for Hennepin Theatre Trust, which presents Broadway in Minneapolis. The Trust gets 25 cents for each pint purchased. Mercy (901 Hennepin Av. ), across the street from the Orpheum, went full “Hamilton” with its three-course menu. Executive chef Ben Spangler culled the recipes of Thomas Jefferson's cook, James Hemings, who is considered America’s first French-trained chef and the popularizer of such dishes as crème brulée, whipped cream, macaroni and cheese, and French fries. The older brother of Sally Hemings, Jefferson’s slave and mistress, Hemings also cooked the reconciliation dinner between Hamilton and Jefferson on June 20, 1790. At Mercy, patrons can choose between chilled asparagus or white bean and ham hock soup for the first course, Boeuf a la Mode “Pot Roast” or lobster mac and cheese for the second. The desert is “1800’s Snow Egg,” vanilla ice cream in a poached meringue. It is served with brandied cherry sabayon. Yum.